The oaks, the last trees to lose their leaves in fall, were down to just a few spots of brittle color when we first learned of Lucy. 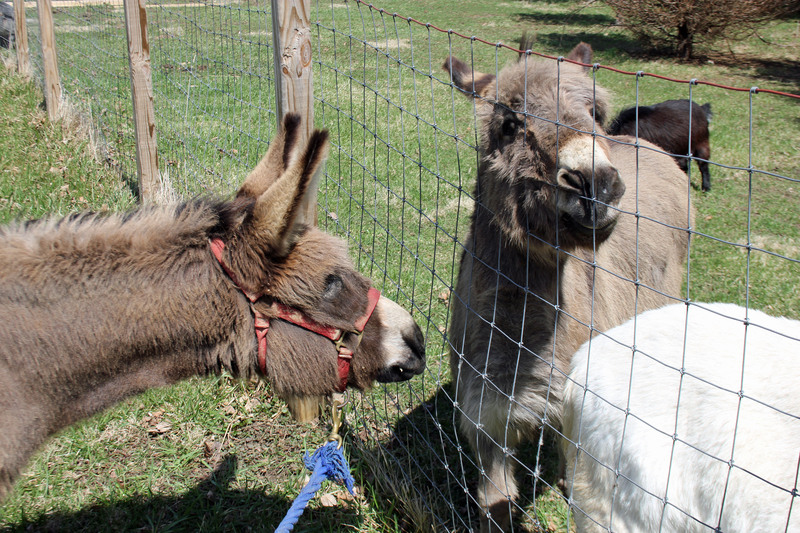 A family in southwest Indiana sent out a distress signal that life had thrown them a curve, making it necessary for them to rehome a small flock of sheep and their guardian donkey. Bot flies and shearing wool appealed to neither our time nor talents, but the thought of opening our gate to another donkey seemed the ticket for our little Buddy. Six months and a bitter winter later, Lucy and her person made the four-hour journey to Riley Township. 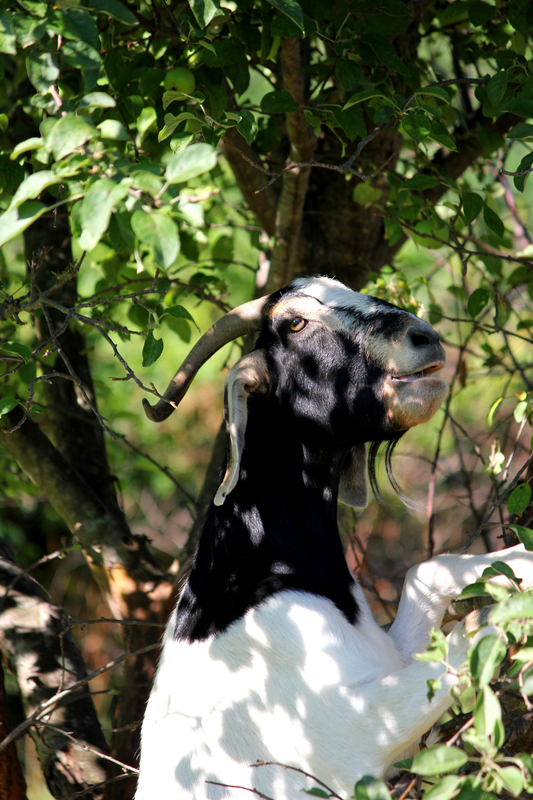 My Steven and I were on the south boundary Saturday replacing old fencing, much to the dismay of two sassy goats whose nimble limbs and twitching noses were turned by the grass on the other side. The job also gave us an excuse to watch for a truck-pulling-trailer with Indiana plates. I think Buddy knew. As I leaned over to stretch the bottom of the fence, he walked up and laid his head across my shoulder. They always know something’s up, whether it’s a storm or a class trip full of adoring little persons with apple slices and peanuts in their pockets. Lucy’s wheels rolled up around 1 p.m. The welcoming committee lined up along the fence to meet the driver, except for Buddy. He pressed himself against the fence and stared in the window of the horse trailer. When Lucy was led through the gate and let off the lead, Buddy did an-honest-to-goodness happy dance. For her part, Lucy was a little stand-offish. 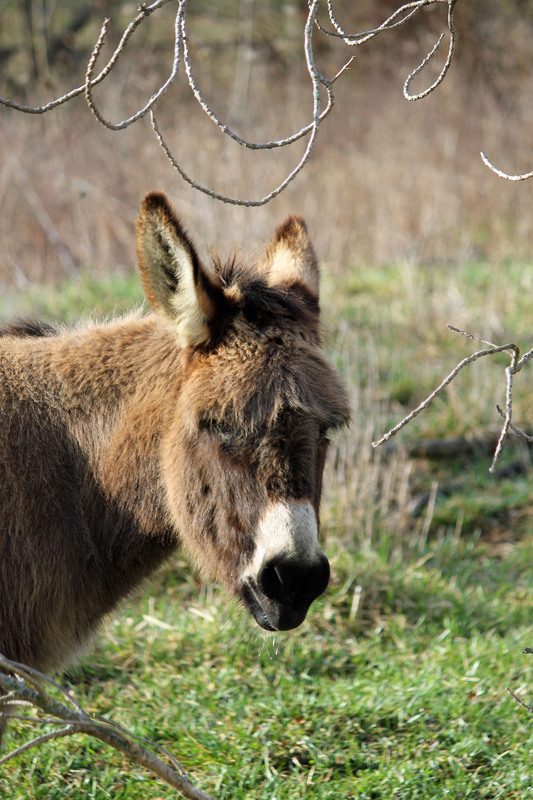 Her person Brandi Ireland told us that they lost a donkey to the winter of 2013-14, leaving a sad Lucy to mind the sheep. For the first hour on Ohio soil, she put on a good show of preferring grass and hay over some boy, but she never let that boy get more than a few strides away. For the rest of the afternoon into evening, Buddy showed Lucy around her new digs, placing himself dutifully between her and the goats. I’m not sure if that was for her safety, theirs, or just Buddy making a statement of ownership. Through human eyes and sensibilities, it seems that Buddy’s warm brown eyes are brighter and five years lifted from his gait in a few hours’ time. The goats are watching them both to see which donkey will figure out how to open the hay barn doors now that the salad bar next door is off the menu. That’s not anthropomorphizing; that’s a day in the life with a Buddy boy and his goats, plus one. Better than a Sudoku puzzle to keep any two-legger on their toes. Sandy was talking about Bill, a Boer goat that she and her husband, Doug, had raised from when he was smaller than a pygmy. And, trust me; she wasn’t kidding (no pun intended). 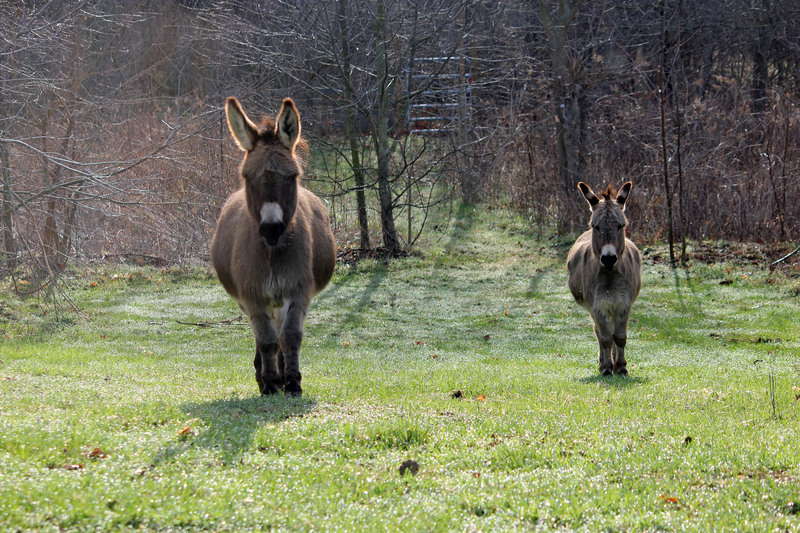 Bill’s bigger than Buddy, the miniature donkey that guards The Quarry Farm: taller, anyway, and he’s the newest member of The Quarry Farm family. Sandy and Doug drove him up from the Cincinnati area, from the farm that the couple is in the process of leaving. They were successful in placing the other animals that lived on their farm, but because of his size, Bill proved a special case. They’d raised him as a pet and they didn’t want him to go just anywhere, were anxious to see that he went someplace safe. After reviewing their options, they chose here and we’re grateful for that. 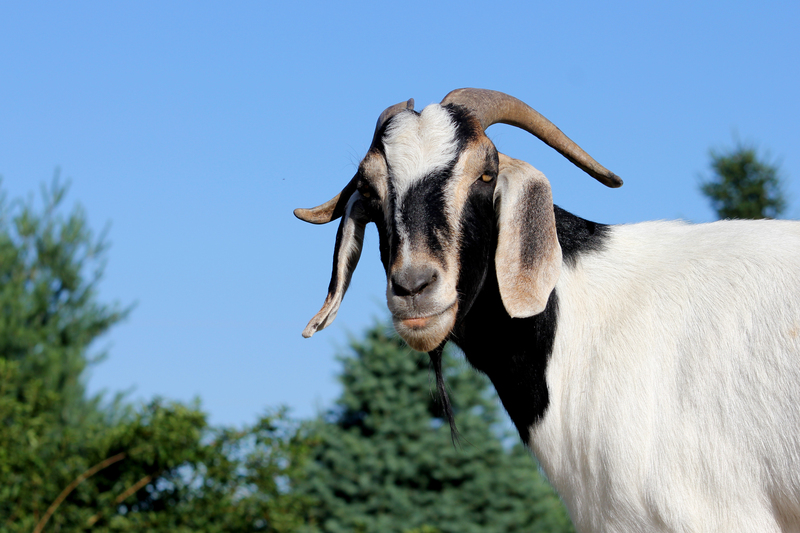 Bill’s every bit as sweet as he is big.It took him a few days to work out just where he belonged in the loose-knit community of goats that already reside here, all of whom are less than half his size, but he did and the pygmies and Nigerian dwarfs are finding his arrival a real boon. Forget the fact that he scrapes out dust wallows for all his smaller cousins before digging up his own. Never mind that, in a pinch, the pygmies can take shelter from the sun in his shadow (and, yes, they do). What’s really important, what all the goats truly appreciate him for (and the pigs, if we’re being honest), is his reach. Standing on his back legs with his forelegs braced against the trunk of a tree and stretching for all he’s worth, Bill can pretty easily top seven feet. And when the trunk he’s braced against is that of an apple tree, well, let’s just say that Sir Isaac Newton would have received more than one lesson on the effects of gravity. Another way of putting it is to say that, rather than a windfall, the animals here are benefiting from a Billfall. Seriously…who needs a cherry picker with Bill around? Not the wee beasties of The Quarry Farm. So, welcome home, Bill. Well come, indeed. For those of you who’ve been paying any kind of attention, the fact that I have a singular fascination for one particular type of bird should come as no surprise. Chickens. I’m talking about chickens. For those of you who thought, “crows”, fair enough, but no. 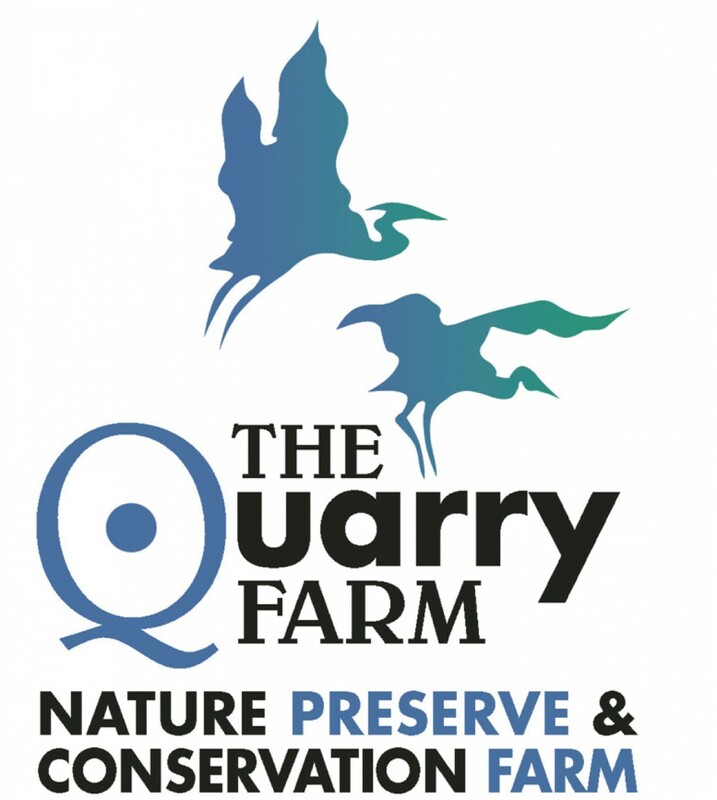 While all corvids caught my heart long ago, they’re a different chapter in the work-in-progress that is The Quarry Farm. 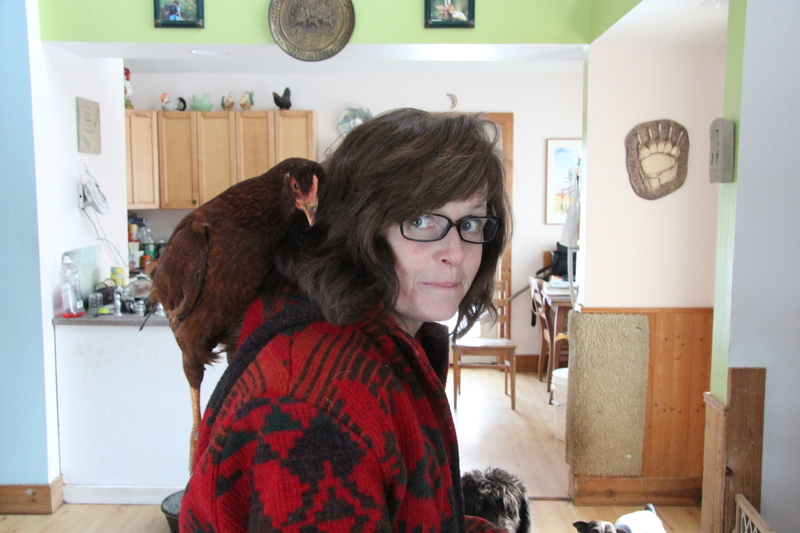 So, chickens. And, more to the point, my fascination with them. And, to grind out an even finer point, how that fascination manifests. I’ve spent more than a fair amount of time wandering with the birds that share this piece of ground with us. I’ve fed them, held them, chatted with them, sung to them and simply sat and pondered the meaning of life with them. And they do, in my opinion. Ponder the meaning of life. I assume, anyway, that that’s what they’re doing when they grow still and quiet, their eyes unfocused and staring. They’re trying to make sense of the nonsensical, resolve order out of the chaos that surrounds them. Or so I choose to believe in more contemplative moments. Chickens. They’ve proven fine companions, a wellspring of calm and the source of a flurry of creativity. They have, and here we get right down to the point, served collectively as a literary muse, even going so far as to inspire a unique style of poetry. It has Asian roots, but its own voice and a distinctive East meets Midwest vibe. feet drumming their dark fury. was, times past, a dinosaur. stalks the yard in fits and starts. 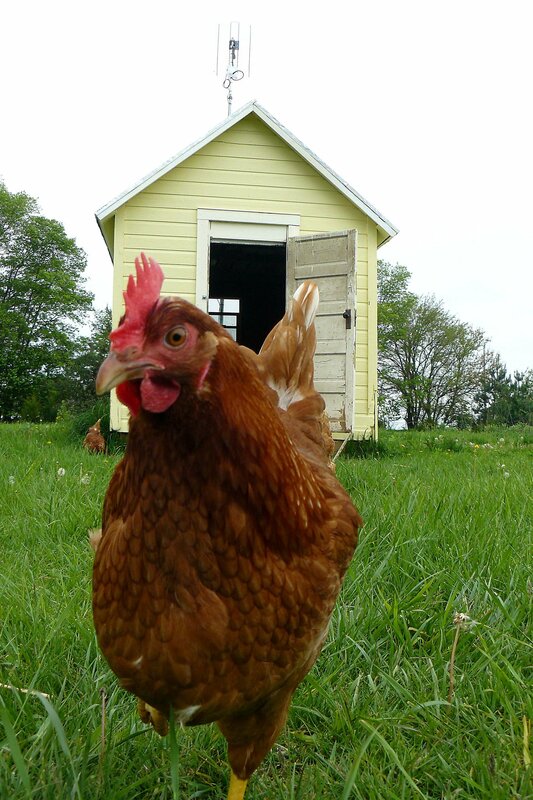 Postscript This winter, eight new chickens, four roosters and four hens, joined the flock that calls The Quarry Farm home. They were part of a larger seizure of dogs, ponies, horses, pigs and fowl carried out by the Allen County Humane Society in the middle of what climatologists called the Polar Vortex and that I simply thought of as The Damned Cold Days. Suffice it to say that the conditions all of the animals were in were inadequate. The chickens came here skinny and dehydrated and while all bore signs of frostbite, some were missing toes and pieces of toes. One, a big white congenial rooster, didn’t survive the winter: a consequence, we believe, of both age and injury. 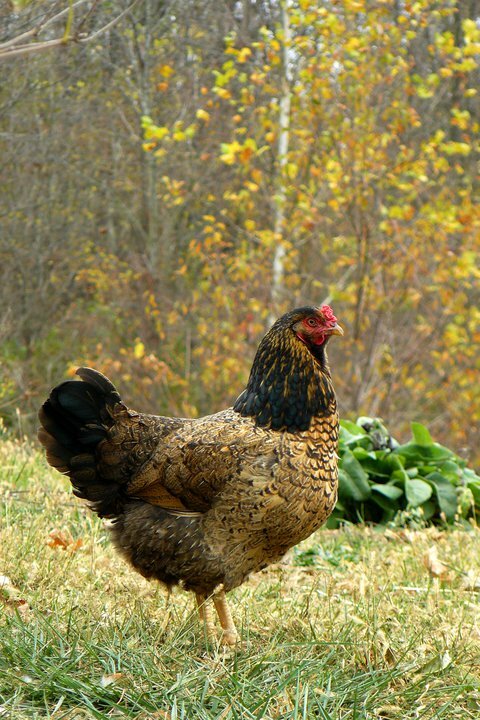 So now there are seven: Wesley, who we suspect to be a bantam rooster cross; Audrey, Too, a red hen who has developed the habit of leaping to our shoulders or onto our arms; and two white roosters and three spotted white hens who have yet to reveal their names. At present, the individuals in the flock total 31, though with Easter on the horizon, that number is likely to rise. Don’t let the turkeys get you down. Have you seen this thing? A simple drawing by Sandra Boynton of an elephant driven to its knees by six or seven of the aforementioned birds? It was everywhere for a while a long while ago (and apparently lives on as t-shirts, coffee mugs, posters and greeting cards; but, then, everything that ever was still is somewhere on the internet). The message was simple: any troubles you have are analogous to turkeys and you shouldn’t let them get you down, those darn turkeys. Yeah? Well, bunk. While I suppose that there are some turkeys out there that are a constant headache, that would do everything in their power to make a person’s life absolutely miserable, the turkeys with which I’ve interacted have been a pure joy. Case in point, the two newest residents at The Quarry Farm. A couple of months ago, Laura Zitzelberger, operations director at Nature’s Nursery Center for Wildlife Rehabilitation and Conservation Education, contacted us about possibly taking in three bronze turkeys that had been seen wandering in a residential neighborhood in Toledo. And, while three were spotted, once volunteers from the center arrived on-scene, only two were found. Of the two, one was suffering from a variety of injuries (the consequence of getting on the wrong side of a dog). So, after rehabbing the bird and determining absolutely that these were indeed domestic and not wild turkeys (bronzes bear a remarkable resemblence to their undomesticated cousins), they contacted us late last week and made arrangements for us to pick them up. We bundled them into the back of Rowan’s Subaru Forester and made the hour long trek back south to Putnam County where we set them up in the same run as Johnny, the Canada goose, and Andi, the Pekin duck. During the whole of the trip, despite being unceremoniously lifted from the home they had come to know and dragged into a whole new situation, not once did either bird make more than an idle and near-inaudible complaint. So here they are now, these two birds we’ve dubbed Fezzik and Inigo. And glad we are that they’re here.